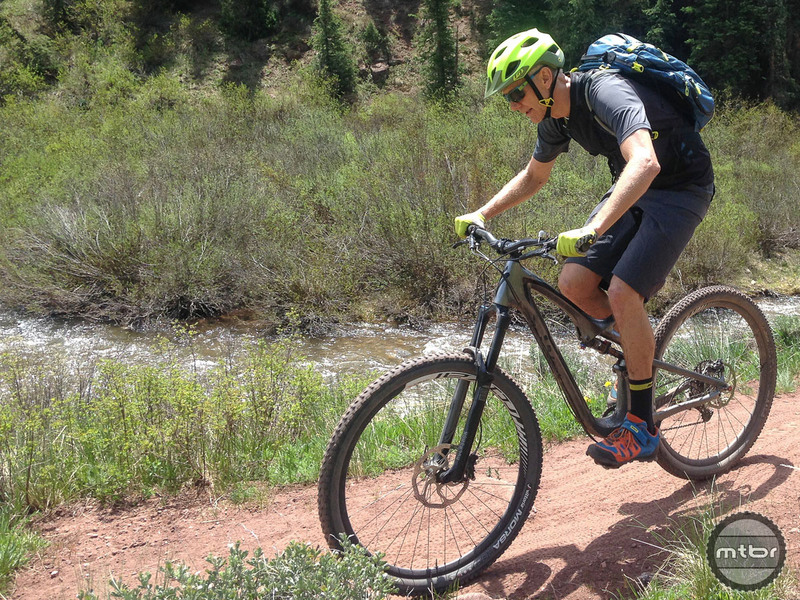 The Morsa is a highly durable all-around tire that climbs well, and offers predictable traction going downhill (click to enlarge). Over the last two years, Vittoria’s tire technology has progressed dramatically, led by the introduction of their Graphene rubber compound. This rubber, denoted by the G+ nomenclature, has received acclaim from cyclists across all platforms for its superb durability. 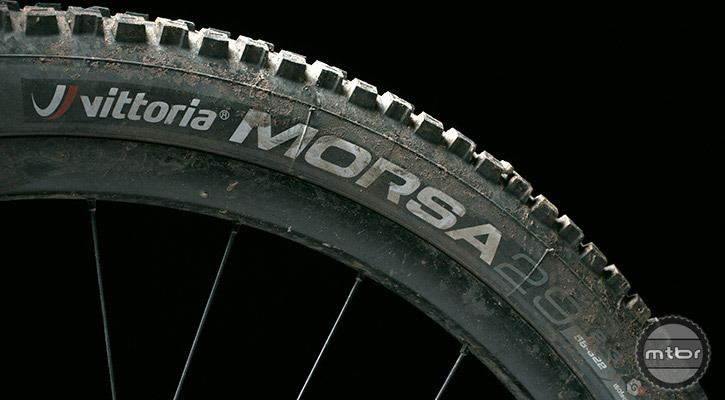 Having already been impressed by Vittoria‘s pre-Graphene Barzo tire, we were excited to see how the more-aggressive tread and the supposed miracle compound worked together in the Morsa G+. Let’s start with the basics. This tire weighs in a 927 grams. Is that heavy? That depends on who you ask, but my answer is “No.” Since I live in San Luis Obispo, California, (where sharp rocks abound) and since my riding is typically gravity-oriented, I tend to shoot for tires in the 800-1000 gram range. Vittoria’s Morsa tire punches perfectly in its weight class. The TNT reinforced casing and extra width add some grams, but also provide noticeable support, durability, and traction. During testing, I punctured the front tire near the center tread. The hole immediately self-healed thanks to tubeless sealant in the tire, and a post-ride session with the needle, glue, and scissors of a tubeless repair kit fixed it right up-but puncturing was a bummer nonetheless. After fixing that hole, I enjoyed hassle-free traction from there on out. While running the Morsa both front and rear for 320+ miles, I had no issues with cornering knobs ripping or cutting, and the tires performed flawlessly (with the exception of that one unfortunate puncture). César, I bought a Kona Process 111 this early spring for my wife and it came with Morsa 2.3 tires. I was skeptical about the grip due to the low center knobs, so I ordered a 2.4 Goma to put in the front. I haven’t ridden this combo all too much, nor the double Morsa combo, but on the few rides I took in damp, loamy NY- with plenty of rocks and roots mind you, I like the speed and traction. I think the Morsa sheds mud fairly well. Good luck! I run Morsa rear/ Martello front and it’s a great combination for 90% of the riding I do, they are a fast rolling combo and only in the very steepest or loosest of trails do I feel the Morsa lacking grip (and only then when I’m not on the side knobs!) I will put a Martello on the rear IF the Morsa ever wears out and see how that works out! The closest combo in terms of similar performance would be the MinionSS/Dhf setup but the Morsa just has the nod on grip over the SS over wider terrain and climbing ability.